My three-year-old daughter has a green hooded towel which she has to have every night after bathtime. Once she puts it on she is “Froggy” and remains so until her pyjamas are on. I have to say that “Froggy” is now rather threadbare and could do with an understudy, so I’m loving the look of these towels. 3 Sprouts are a Canadian company set up by three friends with a love of babies. Their aim is to put a smile on the face of kids and parents with high-quality products, and they certainly achieve that with these great bath towels. Available in Australia for the first time, they are made from organic cotton and terry towelling. 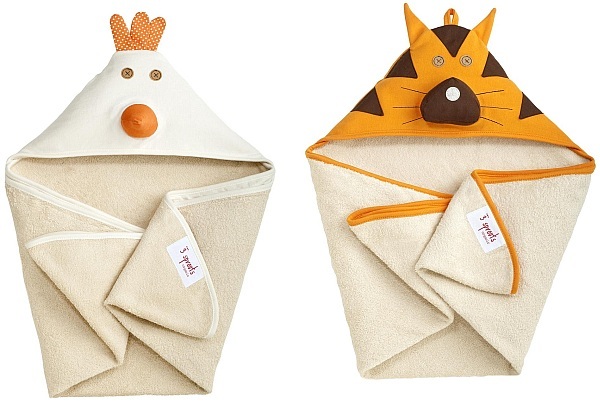 Choose from several cute animal characters such as Chico the Chicken, Hazel the Hippo or my favourite, Tito the Tiger. Suitable for newborns up to eighteen months, these are suitable for the pool or beach too. Each one is $54.95 plus shipping from local stockist IttyBittyGreenie.